My Regency does not have them.... I looked at it earlier and it dosent look like they would fit.. 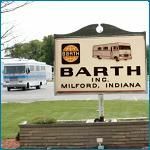 Does anybody have them on an MCC Barth? Same as everyone else. Cost is needed. Put me down for 4. Depending on cost four.Maybe five. From viewing the Gallery pictures it looks like Barth used the three fluted bumper on Regencies and Breakaways. Earlier ones look like Chevy P-30 chrome bumpers (flat face). If your bumper is 10 inches tall these will wrap around the top and bottom. As you can see they cut half moons to follow the profile on the front and rear faces. The finished edge is flat and wraps to the body. This area is left flat, except for slots to let the front bumper move forward to access the generator or engine (guessing about the engine). So it appears an Exacto knife and a little whittling will allow these to fit any bumper as long as it is 10 inches tall. They will come with out any carving and that makes them universal for front and rear and either side. Like everyone else, I need to know the cost, but I'd like 4 if they're not too expensive. I would be interested in a minimum of two and possibly 4, depending on the price. Here is what I've received so far. Bill: I have a price from the mold shop that includes building a new mold($500) and producing 50 for a total unit cost of $40 each. If we did 100 the price will be $36.00 each. On shipping I can put four in a post office flat rate box that goes for $12. So it appears that now is the time to see who is willing to pull the trigger on these. I am still willing to purchase a set of 4 so my cost is $172.00 - I am not making ANYTHING off of these. If we can still sell another 46 of these, I will place an order. Sorry Bill, I'll have to withdraw my order. No problem Danny, I suspected as much when I heard the price too. I am checking another source to see what they say. Lets hold on for now and I'll let you know what another injection molder says. We're not in a rush for these, so I'll check around a little. Could I order mine WITHOUT the gold plating? I hear you and I understand. The cost includes making a mold and the product must be made for UV Degradation and be able to withstand Extreme Cold Weather. These niche items are not cheap in a low quantity ordering scenario. Again, I'm not making ANYTHING on these and I will pursue another avenue or 2 before I toss in the towel. Keep in mind, my coach never had these and I was following up on another members request to look into this. If anyone has a suggestion, I'm all ears. I have not been following this too closely but I understand that some people already have some bumper caps at this time....a mold must exist. Can anyone identify the original supplier? I suppose this is not an original thought. Good luck. When I was young and in my prime; or at least while I was less than 80 years old, still had the Barth & was still physically able to contemplate such matters, I considered using one of my end caps as a template to produce a soft plastic mold in which to cast a replica using available casting resins. If I were able, I would still consider that option. The world is full of "abominable no men," but there must be other Barthmobile members who have the spark & the inclination to think outside the box & develop creative solutions through other than traditional means. As a matter of fact, I just did a Google search for "casting resins," & came up with a long list of resources in that area, including 2 "you tube" tutorials on the process, plus several ads from companies who are in the business. Don't tell me that no one else but I on this blog grew up having to improvise and innovate to obtain almost anything they wanted. You don't have to pay big bucks for a mold in order to use injection molded plastics. Try doing it yourself. If it doesn't work, failure itself is a learning experience. But at least you tried.